If you are an avid online shopper, you have probably encountered applications like Shopperz before. This adware program is developed by Acai Tech Ltd, and it is supposedly there to provide you the latest information on various online deals and discount offers. 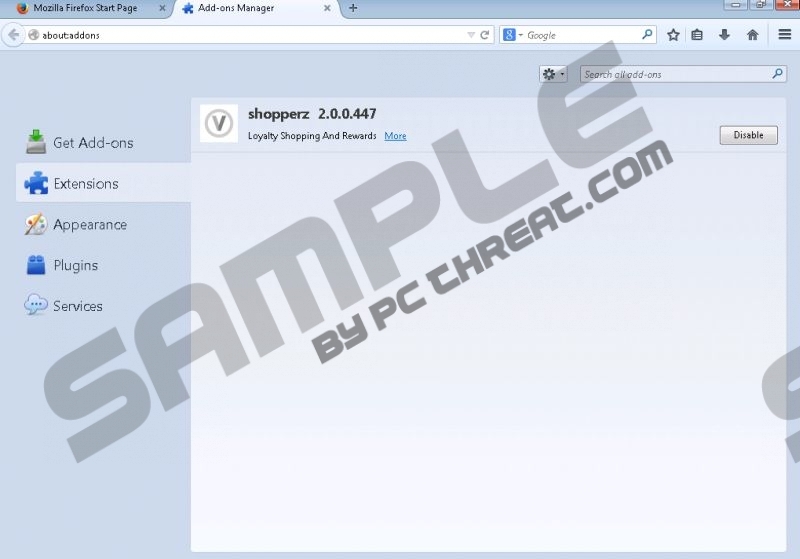 Shopperz is not a malicious computer infection because users often install it willingly. However, they usually do not realize the implications that come with installing such program on their computers. Our computer security specialists recommend removing Shopperz from your system because prolonged exposure to third-party content may lead to serious computer security issues. It would seem that it is possible to find out more about the application at shopperz.me, but this official homepage does not provide you the download link. It only says that you can subscribe to the service by entering your contact details, but it offers no information whatsoever on how to install the application or how to remove it. Thus, we can assume that Shopperz gets distributed bundled with freeware, and if this adware application is installed on your computer, chances are that you have quite a few unwanted programs on board. That is why we urge you to refrain from download programs at unfamiliar websites. If you must have some application, please download it at the official vendor’s webpage and read all the steps on the installation wizard carefully. Truth be told; Shopperz is not a malicious computer infection, and we have already established why. However, due to the fact that it has a rather loose security policy, this adware application becomes a perfect tool for online marketing promotions and even adware distribution. That is why users are always warned about clicking Shopperz ads aimlessly. We can never know what kind of content is embedded in those advertisements, and it is important to note that Shopperz does not review the third-party content. Hence, if you click an ad and it leads you to a corrupted website, you have no one else but yourself to blame. To protect your computer and yourself from potential threats, you have to remove Shopperz right now. Do not tolerate this adware application just because it seems that the only thing it does is spam you with annoying ads. Adware programs can be even exploited as malware distribution tools, so you need to take all the risks into account. Uninstall Shopperz manually via Control Panel and then double-check to see whether you have all the unwanted programs and files removed completely. Scan your computer with the SpyHunter free scanner to be absolutely sure that the system is safe. Select Uninstall a program and remove Shopperz. Open Uninstall a program and remove Shopperz. Access Add or remove programs and uninstall Shopperz. Quick & tested solution for Shopperz removal.